A European Commission (EC) delegation led by Gerassimos Thomas, the Commission's Deputy Director General for Energy, visited the NEA on 31 January for high‑level discussions on the current state of nuclear technology and ongoing collaboration between the two organisations. Discussions also touched on the recent NEA studies on electricity system costs and the decarbonisation of electricity systems. The NEA wishes to thank the EC delegation for their visit, which enabled detailed exchanges of information and ideas. The Nuclear Risk Research Center (NRRC) of the Central Research Institute of Electric Power Industry (CRIEPI) and the NEA Working Group on Risk Assessment (WGRISK) held the Workshop on Improvement of Risk Management at Nuclear Power Plants on 29‑30 January, in Tokyo, Japan. The workshop was attended by more than 100 participants representing government bodies, the industry and academia in Japan, as well as experts from the NEA, the International Atomic Energy Agency (IAEA) and those engaged in NEA working group activities. During his opening remarks, NEA Director‑General Magwood highlighted the importance of Probabilistic Risk Assessment (PRA) in supporting the new regulatory paradigm of considering both the prevention and mitigation of severe accidents. 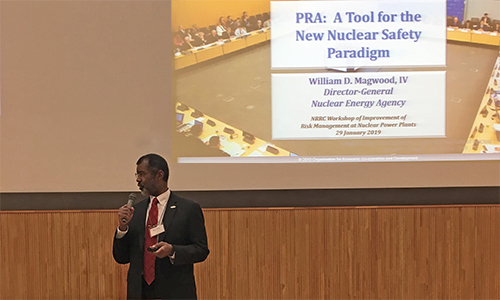 The workshop provided opportunities for open discussion on such topics as the status of PRA models for Japanese nuclear plants and the use of PRA to enhance discussions between regulators and licensees. 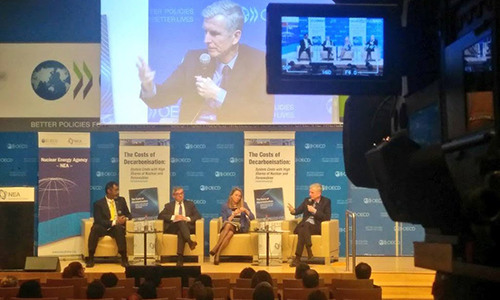 It also highlighted the advantage of risk‑informed decision‑making, particularly as it is reflected in nuclear safety inspection activities such as the Reactor Oversight Process (ROP). 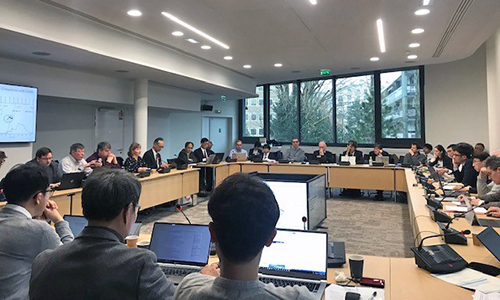 More than 20 organisations from NEA members countries gathered at the NEA on 22‑23 January to discuss the NEA Analysis of Information from Reactor Buildings and Containment Vessels of Fukushima Daiichi Nuclear Power Station (ARC‑F) Project. The ARC‑F Project was proposed by the Nuclear Regulation Authority (NRA) of Japan and the Japan Atomic Energy Agency (JAEA) as a response to the recommendations made by the NEA Senior Expert Group on Safety Research Opportunities Post‑Fukushima (SAREF) in its 2017 report. 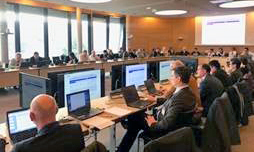 At the meeting, participating experts confirmed the programme for their collective research in the refinement of analysis for accident scenarios and associated fission product transportation/dispersion in follow‑up to the NEA Benchmark Study of the Accident at the Fukushima Daiichi Nuclear Power Station (BSAF‑2) Project. They also agreed on designing a future R&D framework for sampling analysis. The NEA also held a joint SAREF workshop on 24 January focusing on the Fukushima Daiichi decommissioning project. Organised with the support of the International Research Institute for Nuclear Decommissioning (IRID), the Nuclear Damage Compensation and Decommissioning Facilitation Corporation (NDF), the NRA and the JAEA, the workshop was attended by experts involved in associated NEA activities and those who participated in the ARC‑F meeting. Participants discussed updates on the inter‑reactor investigation operations and fuel debris sampling/retrieval strategy at the Fukushima Daiichi site. They also discussed NEA activities, including the NEA Radioactive Waste Management Committee (RWMC) Expert Group on Characterisation Methodology of Unconventional and Legacy Waste (EGCUL). The EGCUL recently held its first meeting in Fukushima in November 2018. The workshop programme included panel discussions to strengthen co‑ordination among such NEA projects and to explore future activities. The workshop participants acknowledged Fukushima reconstruction efforts, which are triggering new forms of innovation and collaboration. At the end of the workshop, the participants enjoyed food made from agricultural products grown in Fukushima Prefecture. 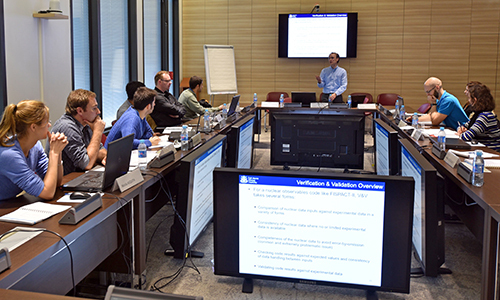 In conjunction with this workshop, the NEA Preparatory Study on Fuel Debris Analysis (PreADES) Project, a sister project of ARC‑F, also held its Programme Review Group and Management Board meetings on 25‑29 January. Currently nearing its half way point, the PreADES project is aimed at working on fuel debris characterisation and prioritising the needs for fuel debris sample analysis. The project plans to launch a discussion at its next meeting on designing a future R&D framework for fuel debris sampling analysis. The new NEA Expert Group on Recovery Management (EGRM) held its first meeting on 10‑11 January. During this kick‑off meeting, the participants held operational discussions on the group's guiding documents, including its mandate and future programme of work. The main objective of the EGRM is to assist NEA member countries to improve their post‑accident recovery planning. The group will survey existing national recovery frameworks and identify approaches which have been effectively implemented to achieve national goals. It will also identify the key lessons learnt from past events. The group will ultimately develop a guidance report on developing nuclear and radiological post‑accident recovery management frameworks which can be adapted to different national conditions. 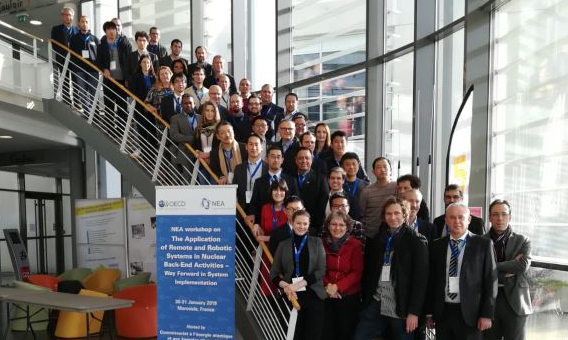 The NEA organised a workshop on the application of remote and robotic systems (RRS) in nuclear back‑end activities, hosted by the French Alternative Energies and Atomic Energy Commission (CEA) in Marcoule, France on 30‑31 January. The workshop was attended by more than 60 experts from 17 countries (including non‑member countries China and Israel), representing RRS developers, suppliers, implementers, regulators and decision‑makers. The workshop facilitated an exchange of information among these different interested parties and helped them explore potential joint activities to support the development and application of RRS in back-end activities. The workshop participants expressed their support for the establishment of a relevant NEA initiative and their interest in participation. The NEA held a workshop on Information, Data and Knowledge Management (IDKM) on 22‑24 January to present the outcomes of three NEA initiatives: Preservation of Records, Knowledge and Memory Across Generations (RK&M), the Radioactive Waste Repository Metadata Management (RepMet), and the Expert Group on Waste Inventorying and Reporting Methodology (EGIRM). The workshop, which attracted more than 70 participants, explored not only the technical aspects of IDKM in different scientific communities (e.g. high energy physics, geoscience and aerospace), but also the social and human aspects of IDKM (e.g. societal involvement and semiotics). During this workshop, the NEA Radioactive Waste Management Committee (RWMC) sought recommendations from the participants for the definition and planning of future activities in the area of IDKM. In order to support the discussions, the workshop included presentations on current IDKM activities in the most advanced nuclear countries, identifying the current needs, challenges and expectations. The International School of Nuclear Law (ISNL) is a two‑week course designed to provide participants with a comprehensive understanding of the various legal issues relating to the safe, efficient and secure use of nuclear energy. 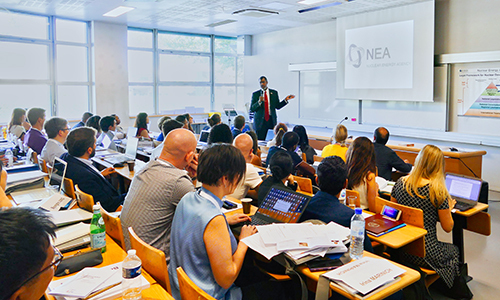 Established by the NEA in 2001 in co‑operation with the University of Montpellier, this programme has provided a unique educational opportunity to more than 1000 graduate students and young professionals worldwide. The next session of the ISNL will take place from 26 August to 6 September 2019 in Montpellier, France. Applications may be submitted online up until 31 March 2019. For more information on the course and to apply, see oe.cd/ISNL. 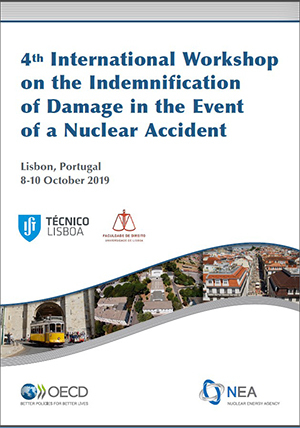 The Fourth International Workshop on the Indemnification of Damage in the Event of a Nuclear Accident will be organised on 8‑9 October 2019 in Lisbon, Portugal, in association with the Instituto Superior Técnico and the University of Lisbon Faculty of Law. This workshop, the fourth in its series, will continue exploring the practical application of the international nuclear third party liability instruments in the case of an incident at a nuclear installation—including with regard to non-Convention States. It will address determination of the nuclear damage to be compensated and transboundary claims handling. The Management Board of the NEA Thermodynamic Characterisation of Fuel Debris and Fission Products Based on Scenario Analysis of Severe Accident Progression at Fukushima Daiichi Nuclear Power Station (TCOFF) project met on 31 January‑1 February. 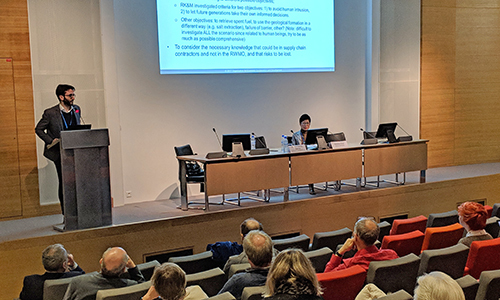 During this meeting, the outcomes of the following R&D projects were delivered and presented: Experimental investigation of the phase equilibria in the U‑Zr‑O and U‑Zr‑Fe‑O systems; Physical‑chemistry of fission products phases with a potentially long‑term radiological impact: experimental studies of the Ba‑Sr‑Cs‑Mo‑O system; Vaporisation and thermodynamics of Cs‑bearing compounds in the Cs‑Si‑O, Cs‑B‑O, Cs‑Mo‑O, Cs‑Cr‑O, Cs‑Fe‑O systems studied by high‑temperature mass spectrometric method; Water leaching tests of radionuclides from matrices of aged Chernobyl "lava" and corium; and Application of chemical equilibrium techniques to the determination of thermodynamics of Cs and Si compounds. The participants also finalised the programme of the upcoming workshop on "Materials Science for Severe Accident and Fukushima Daiichi Decommissioning", which will be held on 10‑12 July 2019 in Fukushima, Japan, hosted by the Japan Atomic Energy Agency (JAEA) Collaborative Laboratories for Advanced Decommissioning Science (CLADS). Further information on registration and abstract submissions is available here. 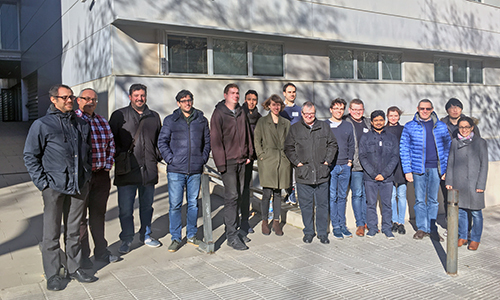 The NEA Data Bank organised a training session from 28 January to 1 February on Electron‑Photon Transport Modelling with the Monte Carlo code PENELOPE, a computer program widely used in radiation dosimetry and radiotherapy. Hosted at the University of Barcelona, the course attracted 14 participants from six countries, who benefited first‑hand from the knowledge and dedication of the code developers. The NEA Data Bank Computer Program Services organises several training sessions every year, contributing to the dissemination of state‑of‑the‑art codes and engaging the nuclear community. These week‑long courses provide a unique opportunity to bring together code users from around the globe and facilitate exchanges on the use of computer codes. Further information on the NEA Data Bank training courses is available at oe.cd/nea‑db‑course. Taught by the Monte Carlo N‑Particle Transport Code (MCNP) team at Los Alamos National Laboratory, this introductory‑level course surveys the features of MCNP and introduces beginner users to the capabilities of the program. It provides the participants with hands‑on experience at running the code to solve simple problems. 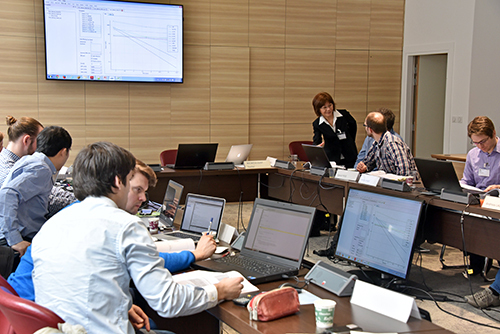 Course topics include Basic Geometry; Source Definitions; Output (Tallies); Advanced Geometry (repeated structures specification); Variance Reduction Techniques; Statistical Analysis, Criticality; Plotting of Geometry and Tallies; and Neutron/ Photon/Electron Physics. For further information and to register, see oe.cd/nea‑db‑course. Taught by the Monte Carlo N‑Particle Transport Code (MCNP) team at Los Alamos National Laboratory, this course provides a brief overview of the MCNP basics and then advances into more complex features within the code. It provides the participants with hands‑on experience at running the code to solve simple problems and the opportunity to explore the features of the latest MCNP version, MCNP6.2. Course topics include: Advanced CSG Geometry (universes, lattices, repeated structures); Advanced Source Definitions (repeated sources, surface source read/write); Advanced Tallies & Variance Reduction (repeated tallies, perturbations, pulse‑height tallies, dxtran, weight windows); Introduction to Parameter Studies; Intrinsic Source Generation; and MCNP Tools. For further information and to register, see oe.cd/nea‑db‑course.